Designed for self-sufficiency, this modern take on the traditional bach stands up against super-sized holiday homes. 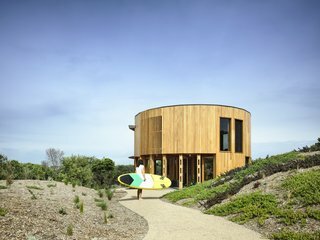 Tired of the large, cookie-cutter houses popping up across Australia, the owner of a remote stretch of coastline on Mornington Peninsula’s St Andrews Beach tapped the creative minds at Austin Maynard Architects for the antithesis of the McMansion style. 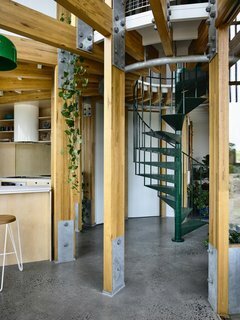 "The owner challenged us to design and build him a ‘bach’ in the dunes," the architects explain, referring to the New Zealand term for the simple and modest beach shacks that rose to prominence in the 1950s and were typically built of recycled materials. 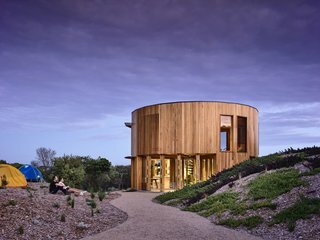 Located on Victoria's Mornington Peninsula, St Andrews Beach House is set on wildly beautiful and remote coastline abutting national parkland. "Regardless of how much money you’ve made, you get yourself a bach, and that bach has to be the most basic, down-to-earth thing." 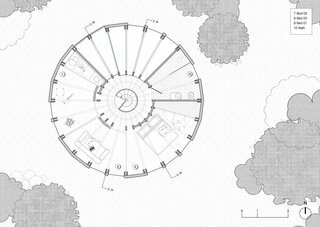 To that end, the house was simplified to a circular, corridor-free design that prioritizes views of the expansive landscape in all directions. The silvertop ash shiplap boards that clad the home will develop a patina over time. 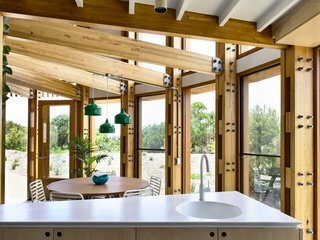 Double-glazed Thermotech windows bring the landscape indoors. Like its midcentury predecessors, the St Andrews Beach House is modestly sized at nearly 1,500 square feet. 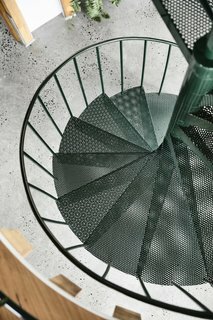 Centered on a spiral metal staircase, the home is split across two levels with the open-plan communal areas and service spaces on the ground floor and the informal sleeping quarters tucked upstairs. The architects left part of the upper level open to turn the dining area and part of the outdoor patio into airy, double-height spaces. 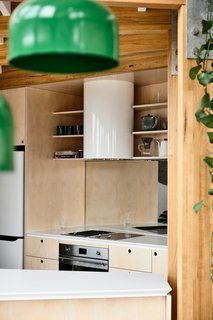 The kitchenette includes two Smeg cooktops (a ceramic electric and a stone grill) as well as a Qasair Albany suspended hood. 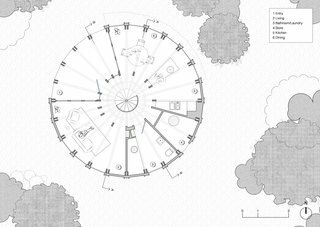 A wedge-shaped patio, carved into the circular floor plan, opens to the landscape to facilitate indoor/outdoor living. Bi-fold doors seamlessly connect the dining and living areas on either side to the patio and the outdoors. Bi-fold doors on either side of the wedge-shaped patio open the dining area and living room up to the outdoors. 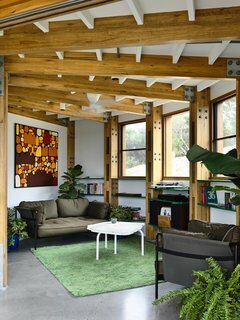 The cozy living room pulls the outdoors in with its earthy palette and abundance of indoor greenery. 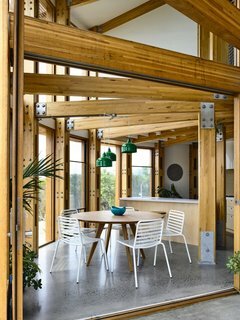 "The house displays an innovative use of timber with chunky details and exposed portal frames," the architects note. "This is not a slick beach house, but a relaxed and informal escape, designed with materials that will patina and weather, like an old coastal wharf." All rooms revolve around the centrally located Enzie Universal series 1500 spiral staircase. 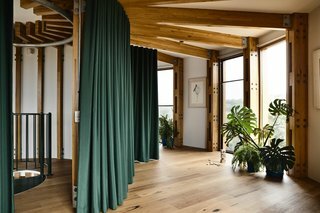 The spiral staircase and railings are finished in Dulux Classic Hawthorn Green Gloss to match the indoor plants, green curtains, and green pendant lighting. 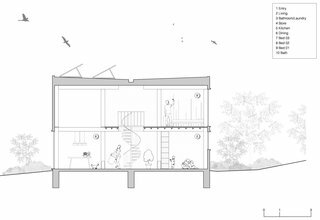 Self-sufficiency and sustainability have largely driven the design, from its site-sensitive footprint that measures less than 17 feet in radius to the maximization of passive solar principles throughout. 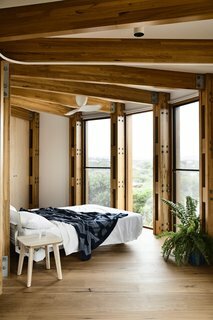 The architects note: "Rather than design a series of sealed bedrooms, each with ensuite and walk-in-robe, the sleeping zone at St Andrews Beach House is informal, casual, and relaxed, where floor space is the only limitation. 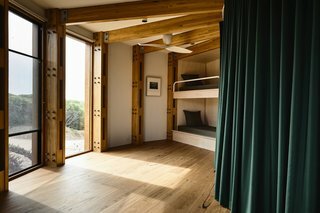 And when that limitation is reached, guests are invited to pitch a tent on the soft sand outside and use the house as a central hub." Bunk beds are tucked into the far end of the upper level. The flexible space can also be used as a second living room or as a games room. 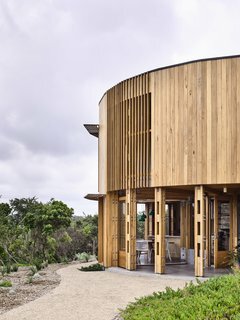 Rooftop solar panels power the fossil-free home, while a large cylindrical concrete water tank—placed near the front of road like a gateway marker—collects rainwater for reuse in the bathrooms and gardens. 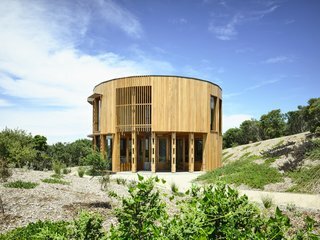 Wild bush, sand dunes, and scrub surrounds the circular home. The architects were careful to minimize the building impact on the fragile landscape. "Though the building is precise, following the rigid geometry of a circle, staying here provides a complete escape from regular life," the architects add. "Not adhering to a typical layout allows you, if not forces you, to live differently." A peek inside one of the two bedrooms. Blackbutt strip timber flooring is used throughout the upper level. 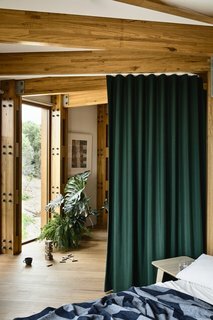 Instead of walls, curtains are used for privacy. 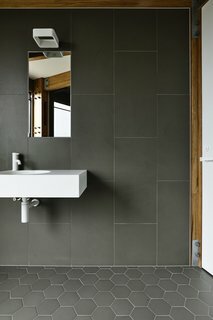 Mutina Phenomenon porcelain stoneware tiles line the bathroom walls and floors. 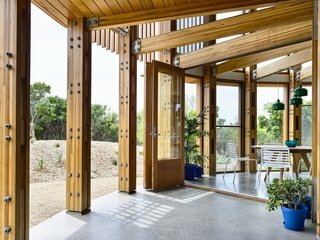 The architects write: "Most Australians want a deck or veranda, instead of adding something to the outside, like that of the classic old Australian home. At St Andrews Beach House, the deck has been eroded out of the form itself, creating a two-story space that’s both outside and inside."